4oz Stainless steel hip flask. Boxed. 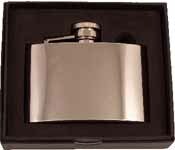 A stainless steel 4oz hip flask bound with genuine brown Spanish leather provides a wonderful soft feel to this stylish hip flask. 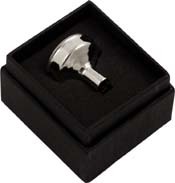 Other features include a hinged lid and oval engraving plate, nicely presented in a strong presentaion box.